I'll be the first to admit, I'm interested in much and expert in little. However, that's not to say I know little. As far as one can "know" anything, I know some stuff; and, who's really in the mood for an epistemological debate right now? Not me. 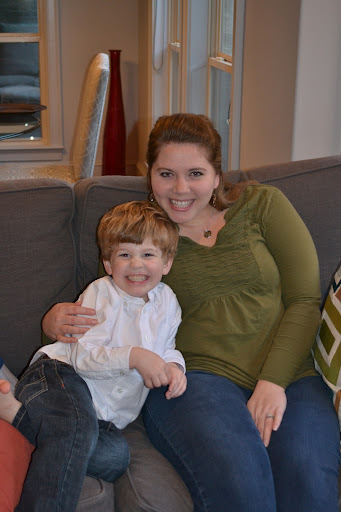 I've long considered writing about Spencer's experiences with speech and occupational therapy, and my experience with it by extension as his mother. There are many reasons to "share" with friends and strangers, foremost being I would love for our experience to help and encourage people who are in similar situations as well as to answer questions or offer better explanations to people who are completely foreign to our situation. There are also many reasons to keep this all to ourselves. And up to this point, those reasons have won out. Emotions, opinions, and philosophies seem to meld into one single "way" many therapists believe young children with specific deficiencies should be treated. This wouldn't be that much of a problem, except that while I am able, willing, and happy to bring all of my biases and beliefs to the table when considering treatment options; many therapists are not. Make no mistake, they do bring all those things to the table, but they don't call them what they are--biases and beliefs. And, so, you see my conundrum. To help a child, you have to be honest about what you "know," what you don't know, and what you "believe" (in a broader sense). This post in particular is prompted by this time of year. For it was about a year ago that I was first forced to face this clash head on. 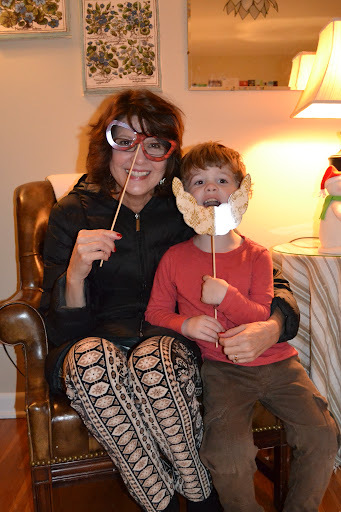 I'd faced it many, many times simply as a mother; but typically the encounters regarding what was best for my child in his early years were handled with some degree of sociological grace. We could agree to disagree what was best for him, after all, he was "doing pretty good." But, when he ceased to be "doing pretty good," it was as if years of research, reading, and much thinking were all called in to question. Did the conclusions I drew at that time, before I even knew Spencer, still apply now? 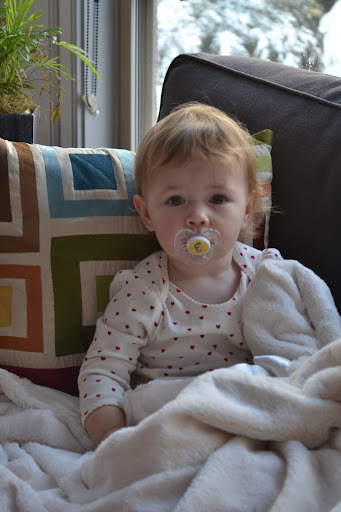 I feel it is "safer" to write a little about our journey now due to our current therapy situation, with which I could not possibly be more pleased or encouraged. Another reason to keep much of this to myself is that I have many family members who are either therapists--speech or occupational--or have children who have been through childhood therapy situations. I love my family members, and I want anything BUT the opportunity to offend them--be it with direct disagreement or subtle inference, both of which are bound to occur at some point, because no two people ever think exactly alike. I also don't want to speak for my family members' whose children have gone through therapy, but I have spoken with them at length and have been much encouraged by their own journeys, so their experience have directly and indirectly informed my decisions. It just all feels very tangle-y. Finally, we are nowhere near the end of our therapy journey, and I know I have much to learn. And there is much that remains to be seen. But since I've written no less than fifty essays about the therapy culture, in my head, of course, typically while driving or doing other mundane, daily tasks, it's probably in my own best interest to go ahead and write them out--literally "out" of me, so maybe I can go on and write some new essays. These are getting old to their author. So, I'll start today with something that will probably offend very few people. I've often wanted therapists and teachers who work with my children to know that during the time they are working with my child, it is not unusual for me to be praying both parties. I pray when I drop Spencer off and as I think of him while he's away from me. I pray that Spencer will do his best, that he'll cooperate, that his little neurons will fire quickly and correctly. That synapsing would be easy and fast. That new pathways would be created. And I pray that the therapist has the creativity, perseverance, and grace to help my child with all of that. I pray knowing it's more than repeating words and cutting out shapes. I pray knowing miracles are happening, and God is using them to bring them about. That may sound overly spiritualized, but I'm no gnostic, so I think it's all connected. I think without therapy, Spencer would speak very poorly. Body or soul; brain growth or miracle--both are probably false dichotomies. So, if you're a therapist or a teacher, know that people are praying for you as well as their child. If you're a parent, I've probably told you nothing new today. Maybe next time. I've been going through old emails and came across something I sent to Jonathan about a funny conversation between Spencer and me dated January 29, 2012. Me: Diaper cream. New diaper cream I got you. Spencer: Oh, thank you, Mommy! Spencer: Thank you, Mommy, for getting me new diaper cream! You got me new diaper cream! 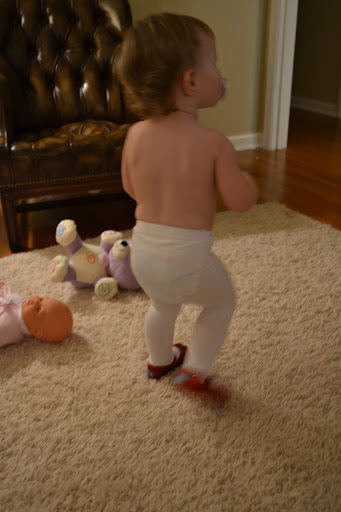 If we can have a conversation where he applauds your diaper cream buying efforts, then it is time to potty train. 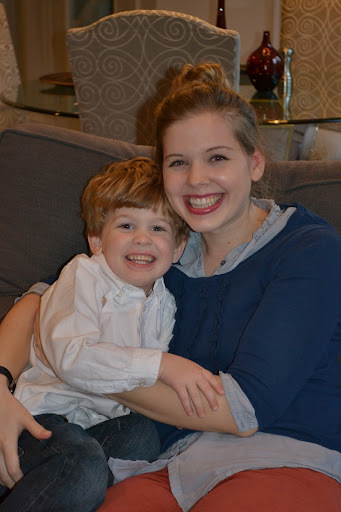 The ice and snow changed our plans of celebrating with Jonathan's sister and her family in Benton with his parents. Nana and G-Dad came to see us Christmas morning before the ice storm, and brought some presents for the kids. As far as my kids knew, they'd had Christmas. 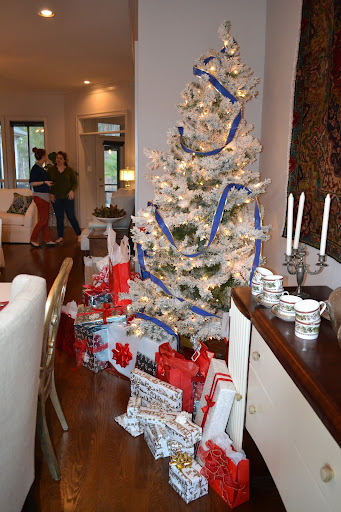 However, Nana does Christmas big, so after Jonathan went on a short trip with friends to the Music City Bowl, and after we all had the stomach virus, I took the kids to Benton to finish opening their gifts. (Jonathan had to stay home because he, you guessed it, also caught the stomach virus). 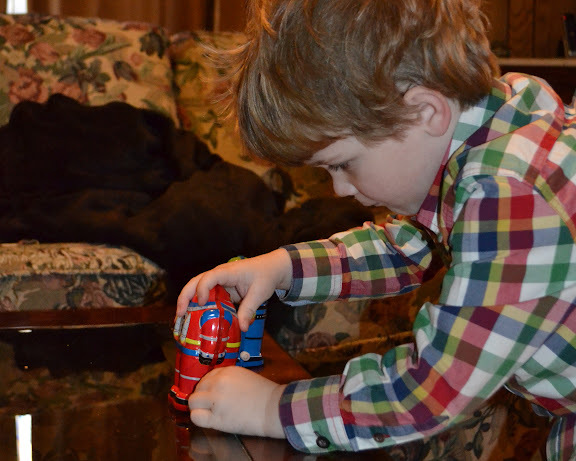 Spencer got some fun costumes, and some wind-up robots--just like on "Max and Ruby." 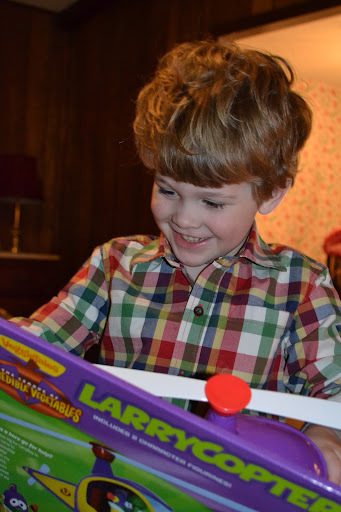 That sweet smile is directed at his new Larry-Copter. 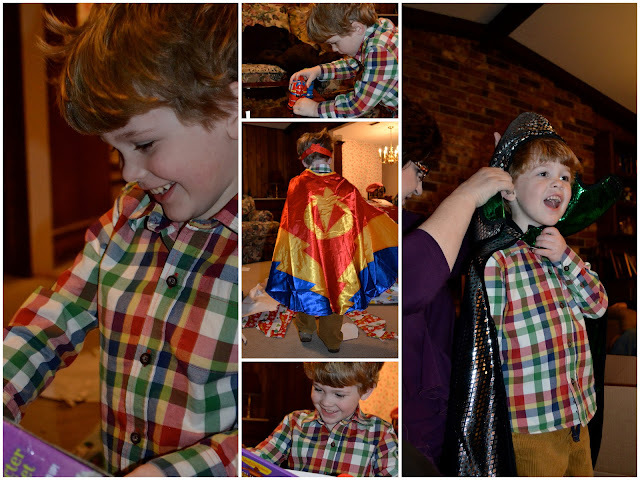 And, I think his favorite present was the set of characters from VeggieTales' "The League of Incredible Vegetables." 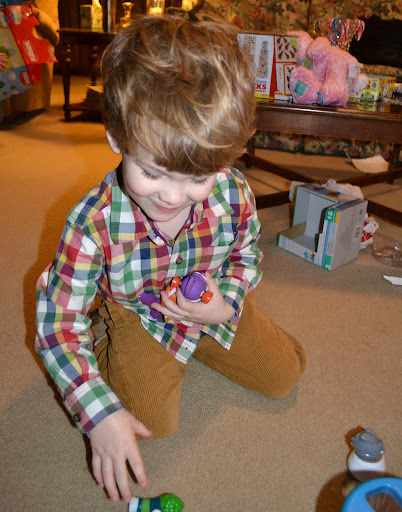 Just today (February 4th), he toted them to speech and occupational therapy and played with them all afternoon. Evelyn got some stacking blocks, and a picnic basket, as well as a tea pot, and an elephant that blows balls everywhere. She was (appropriately) overwhelmed and also very interested in Spencer's new toys. She loved her teapot that sounds like it is really pouring tea. She had me pour her some tea (she says "water") over and over again. Each time she would look in the cup really confused and then try to drink water out of it. Ha! Spencer has really enjoyed showing her how to build and knock down a stacking block tower. The kids were tired and still not quite back to themselves after the holidays, the ice and snow "trip" at Gigi's, and the fist stomach virus of the year; so, unfortunately, the Benton "Christmas" ended quickly. However, as far as they were concerned they have been thoroughly "Christmas-ed." I think the picture below sums it up nicely--Knight Spencer (with Baby Jesus at his feet). 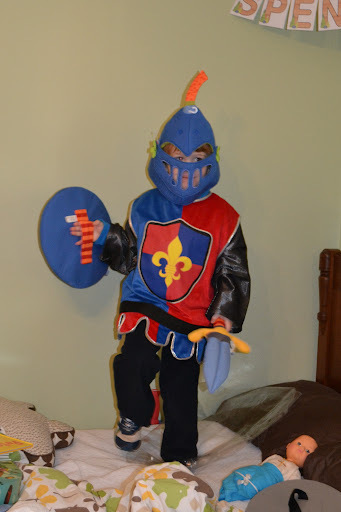 Oh, to be a little boy in a knight costume! All my life, Christmas Day has been spent with my Dad's side of the family. We currently celebrate in Conway. 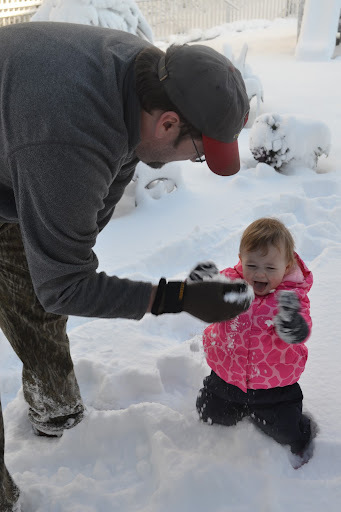 Jonathan and I went back and forth about whether or not to "chance it," but my Dad, being the all-terrain surgeon that he is, was going with his 4 wheel drive power (ha! ), so I asked him if we could ride with him. He'd be able to get us home! We got to Conway just as it started "icing." 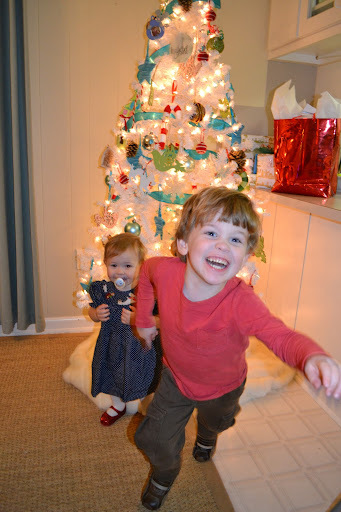 My kids were wild, and I hardly got to chat with family, even the ones home for Christmas from California. Lunch was served rather swiftly, and since my kids were still fussy and wild-eyed, Mimi went ahead and had them open their gifts from her. That was a big upper. People ate lunch, and I chased the kids around Auntie Val's house. Then, we all rather swiftly exchanged gifts. There was talk of dessert being served when it became glaringly obvious that anyone "traveling" needed to get on the road. 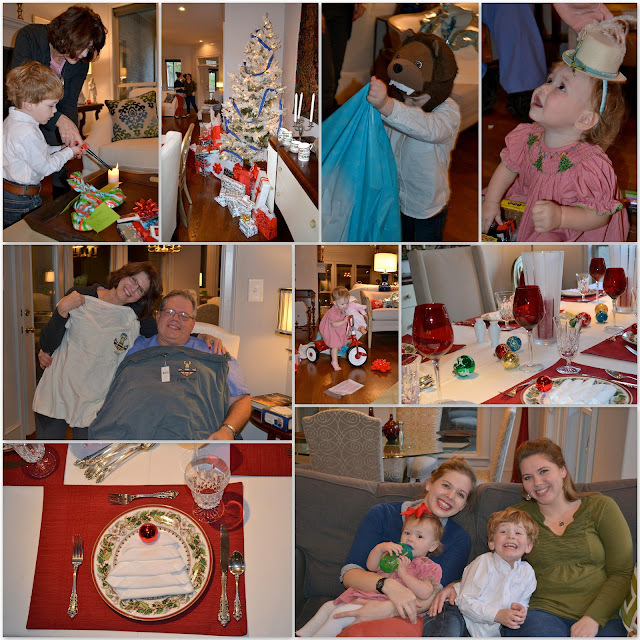 So, we were sent with tons of dessert, hurried Christmas hugs and goodbyes, and off we went. For an icy, stressful ride home. My kids wanted to see what Papa Kurt was really made of, so they screamed for about 1/4th of it. When we arrived at our house, the power was already out. We decided to leave Jonathan there to pack and then come out to my parents' house (where there, historically, has been power because of underground lines) in our van. Bless his heart. He had to pack meds, clothes, food, snow clothes, toys, movies, bedding, toiletries--all asap--and he did. And he made it down the long, treacherous hill to their neighborhood, where there was power. And, then we just watched. 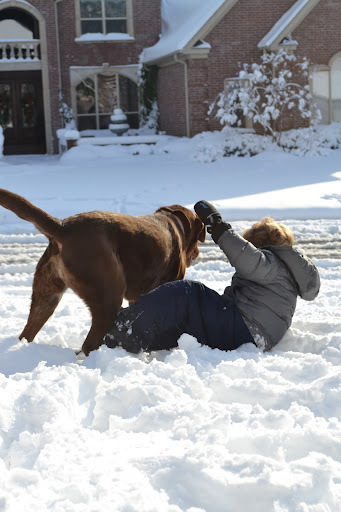 Except for Spencer, he wanted to play in the snow. And we couldn't blame him. 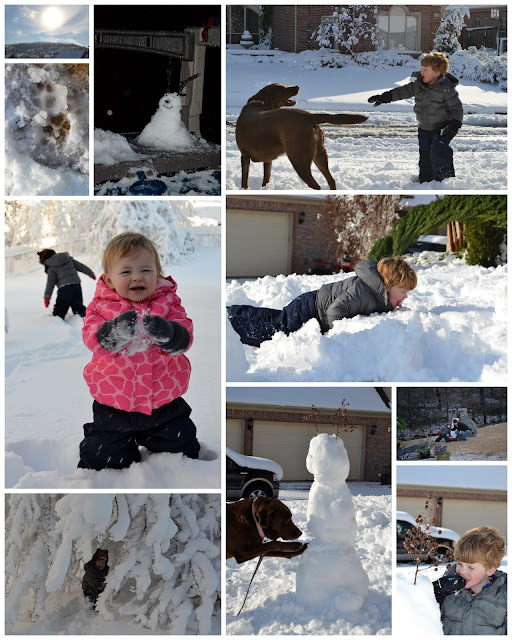 So, Christmas afternoon, he got his first romp in 2012 snow. 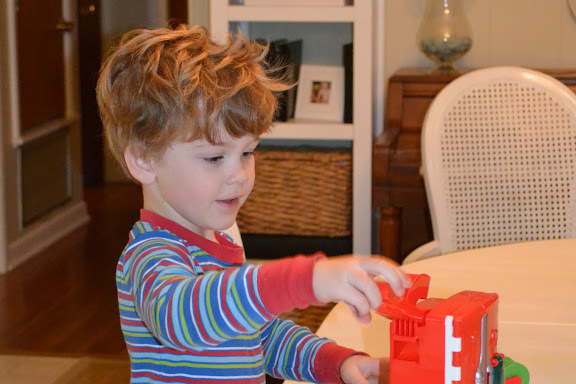 Thanks to "Max and Ruby," he was anxious to make a "(s)'now bunny." Jonathan helped. He was wet, freezing, and loving it. The rest of us were just hoping the power would hold out. And that the kids would sleep. That night, the kids sorta slept. I barely slept (thanks to Spencer's sorta sleeping); but the power stayed on. Christmas miracle just for me and my (maybe) make-believe ulcer. And in the morning light, we just kept looking at the trees, heavy with ice and snow. It was beautiful. If it weren't causing so many people quite a lot of trouble and discomfort, you'd just revel it! We tried to maintain a respectfully somber awe from our heated venue. 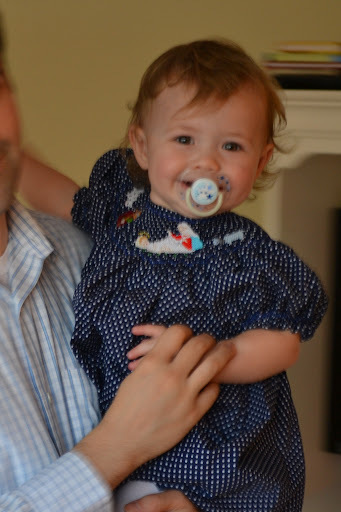 Uncle Tony helped me with Evelyn, while Spencer was already half way to Timbuktu with Jonathan. She loved it for a few minutes. Spencer found a snow den. He was a bear. It was really neat how the branches were covered in ice and snow and bent all the way to the ground. They made a pretty perfect snow den. A day or two later, it still looked like this. I never measured at my parents' house, but there was easily a foot of snow. 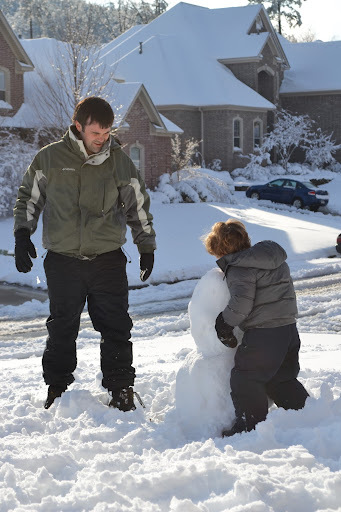 Jonathan worked on a snow man, while Spencer ate from the ground on which Dakota relieved herself all week. Yum. Sunshine on snow is gorgeous. 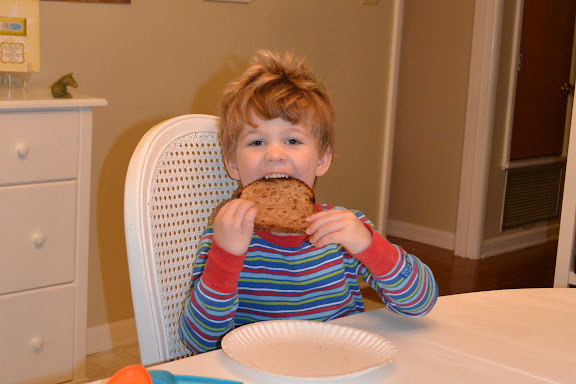 As is my Spencer boy--chapped little face and all. 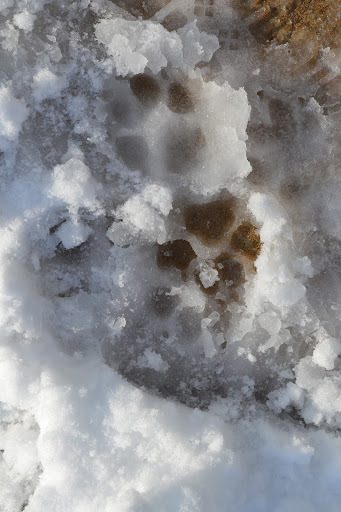 There's Kotie's footprints. She made everything even more fun this holiday season! We miss her. 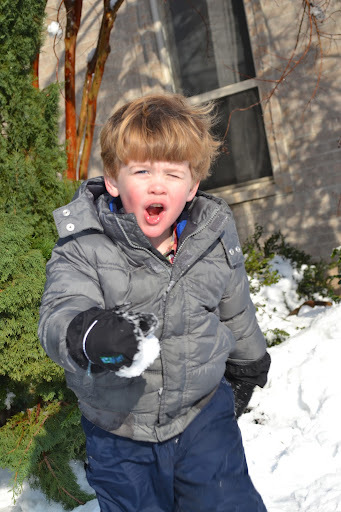 Dakota loved to catch snow balls in her mouth, and it just so happens that Spencer loved throwing them. 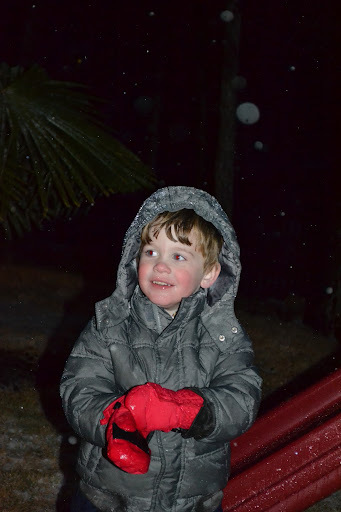 This was the first snow event for which Spencer would keep his gloves and boots on, so he was actually able to play in it for longer than five minutes without getting frost bite. It was by far the best he's done, and he had a lot of fun. We couldn't make the sledding work this time, but I'm sure we'll have some thin Arkansas ice before too long that will be perfect for sledding. 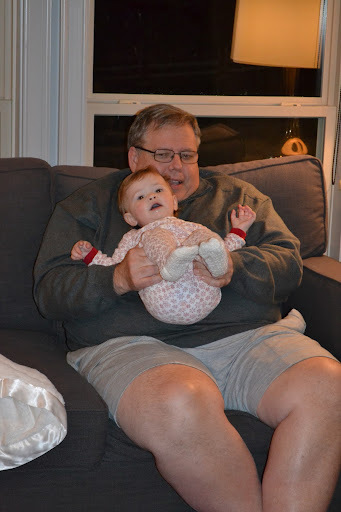 Proof that Evelyn Rose and I joined in on a little of the fun. 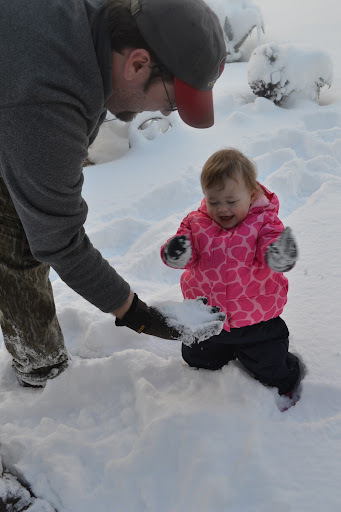 A foot of snow is a lot for a one year old to manage, though. This particular excursion out lasted about three minutes. 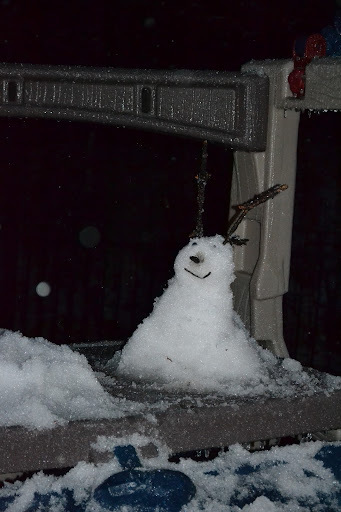 Funniest part of this day was Dakota trying to dig down Jonathan's snow man. There was much screaming and crying and not napping and not sleeping well, though. Just like any "trip" with little ones. I tried to remain calm, and I failed often. After three nights and four days (I think), we headed home to a house with electricity. The internet was not back up for another couple of weeks, a whole separate, never to be bothered with blog post. Spencer loved exploring his backyard full of snow that evening, and Jonathan had to run to work for a bit. Evelyn and I watched Spencer from inside, but I ran out intermittently to talk with him and take pictures. When it wasn't sunny, it was too cold for me. 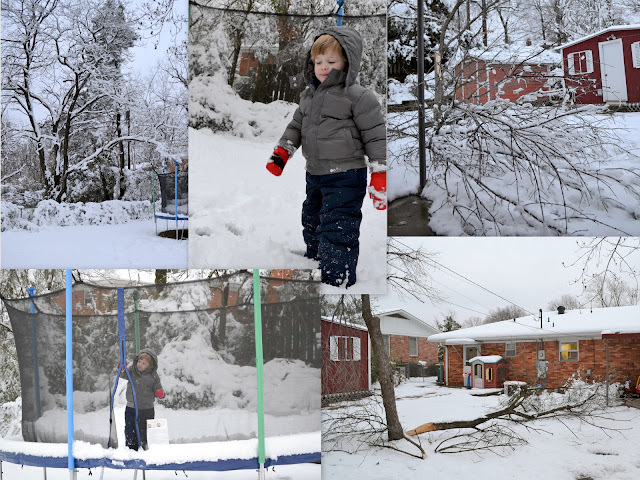 Spencer had so much fun getting on his snow covered trampoline, and as you can see, Jonathan had plenty of fun clean up work after the thaw. We were so very thankful to have had a warm place for us and the kids, not to mention a way to easily keep them fed and entertained; but it was good to be home in our own beds that night! Evelyn and Spencer were something on Christmas morning. The ideas I had about how it would be could not have been less predictive. 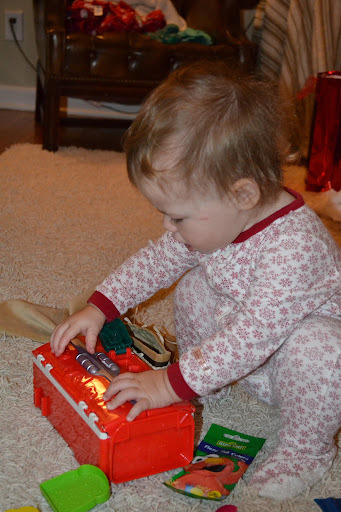 Suffice it to say that Evelyn was very interested with everything in Spencer's stocking. Why I didn't think to buy a fifteen month girl and a four year old boy the exact same stocking stuffers is beyond me. 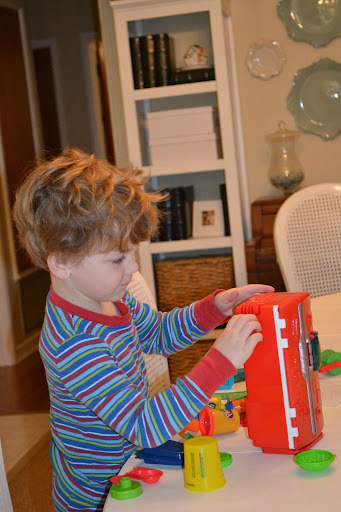 Here, Evelyn is checking out Spencer's play dough refrigerator. And here is Evelyn with Spencer's play dough accessories and his bath tablets. 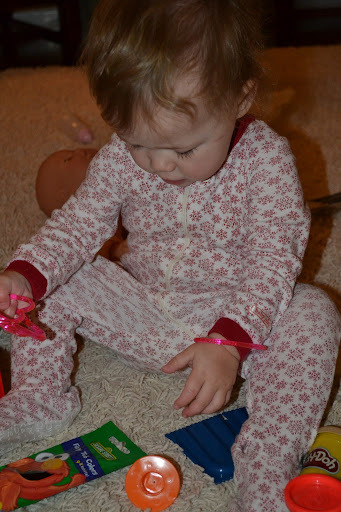 I did convince her to let me put one of her stackable plastic bracelets on. She wasn't really into accessorizing that morning. Spencer was very excited about his own stocking stuffers, so at least I got part of it right. Nothing like play dough before eight a.m.
Evelyn got that juice box holder in her stocking. She liked it for about two seconds. Christmas morning breakfast was, shall we say, "casual" this year. Pay no attention to the disaster in the kitchen. 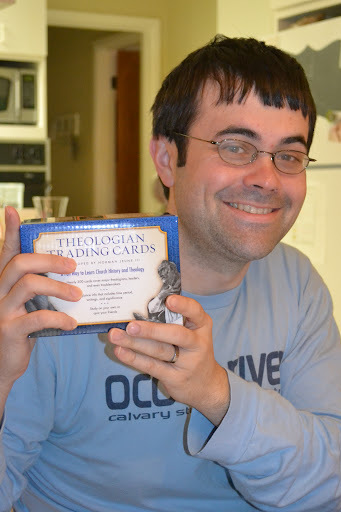 Spencer helped Jonathan open his present from me--Theologian Trading Cards. Jonathan was pumped. We sat for a moment to ingest a mandatory amount of caffeine, and then, I started bugging everyone about the fact that there was supposed to be an ice storm later that day. I'd been mentioning it here and there and my questions and concerns had fallen upon deaf ears. Finally I said, "Call your parents [who we were scheduled to see that afternoon in Benton], and tell them that they can come up and do "Christmas" with us this morning in case we can't get down there this afternoon!" So, Jonathan did, and we did; and it's a good thing, because no one went much of anywhere for days and days after that. 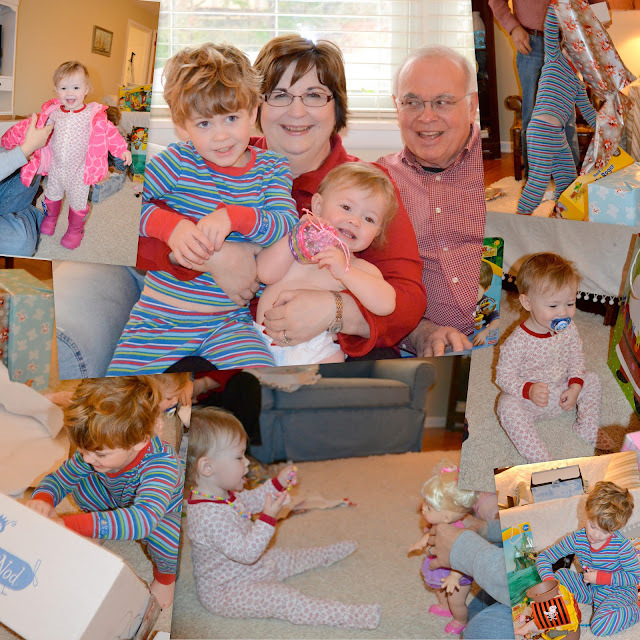 The kids loved Christmas morning with Nana and G-dad. They were fresh, well-fed, well rested. They were so excited to see them. They each opened a winter coat and snow boots that their wise (and humble) mother had insightfully requested they receive. 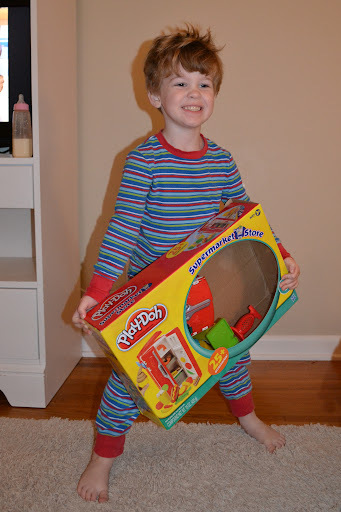 They also opened some some fun toys, which they have really enjoyed. It was impromptu, small scale, and the obvious winner for "Best Tolerated By My Kids" of all the Christmas celebrations of 2012. It was a really sweet and perfect Christmas morning for them. Our church has a Christmas Eve service we attend every year. It's for the whole family, so, as you can imagine, this year it was quite an experience. We marched in with our children with high hopes, and it became painfully obvious that they both were not in the mood. Imagine that, a preschooler and toddler who were wiggly and cranky at dinner and bedtime. We somehow pulled through, a little the worse for ware, and headed back home where I'd set up a scavenger hunt for Spencer (and Evelyn). 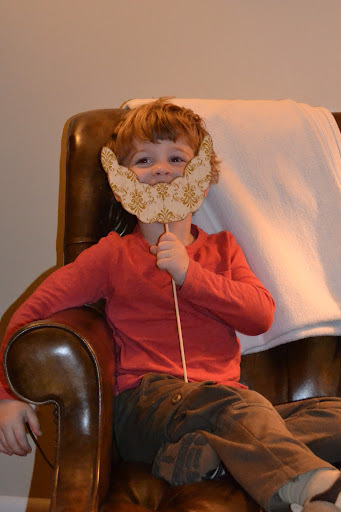 About a week and a half before Christmas Day, Spencer asked me if he could have a baby Jesus for Christmas. I didn't know exactly what to say, so sweetly went on and on about how Jesus was a real person, who was born as a baby, who is God and that we follow Him etc., etc. So, we can't really get Him as a present. Spencer finally looked at me and said something like, "Ok, mom. I just have a 'ba-tend' baby Jesus for Christmas?". Ha! I told him I didn't know if they made those, but that I would check to see if I could find one for Christmas. He went on to tell me that he wanted to put Baby Jesus in the manger and then he ran over to me and said, "Hold me!" It was undeniably precious that he would ask for that, and, even thought I'd already bought him his Christmas gifts, it's like Jonathan said, "I feel kinda weird telling you not to get a baby Jesus for him." So I found a few on the internet, passed on the $200 one, instead ordering the more "reasonably priced one." Then, I had a brain storm, and decided to make his much-anticipated Baby Jesus the surprise gift at the end of his Christmas Eve Scavenger hunt. When we got home from the Christmas Eve Service, I took him to the first clue, written on the back of a picture next to our nativity scene. It said that some of the nativity figures were missing, and Spencer and Evelyn needed to solve the clues to help find them and put them back where they belong. He was so excited, but he refused to start the scavenger hunt until his Papa got there. Thankfully, he arrived not too much longer. It was so fun to watch him be so excited. We'll have do it every year. 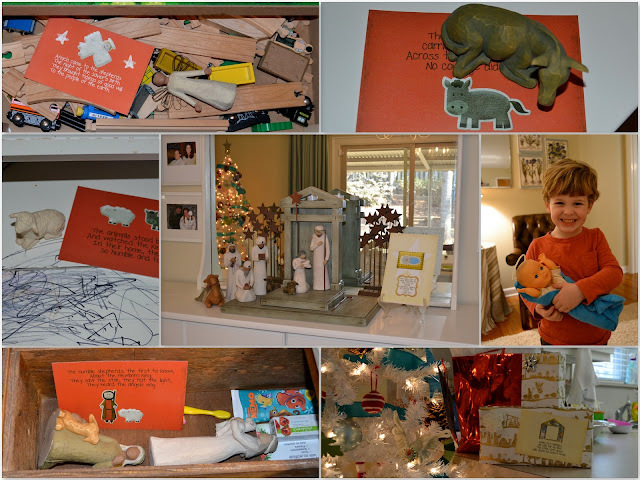 Each clue card had a character or animal from our nativity scene, and I hid them all through the house. The last clue led him to a gift under (ok, near the tree) that had his baby Jesus doll inside. He was so proud and excited when he solved the clues. Yes, if you look closely, you'll see that baby Jesus came with a detachable halo. 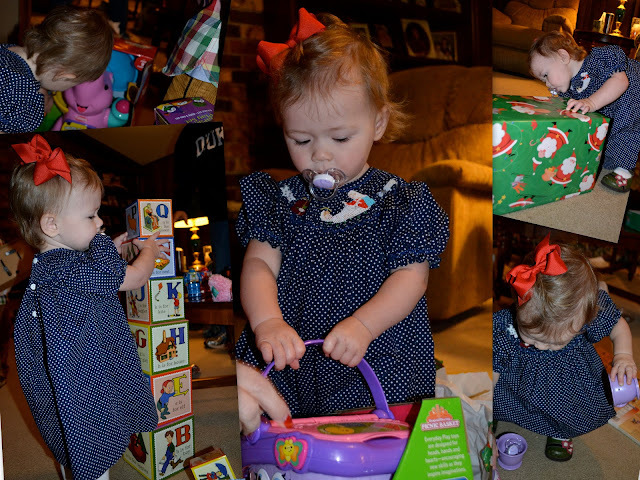 This Christmas was full of hilarious cuteness. "Spencer, go stand by your sister by the Christmas tree." Poor Evelyn. She was trying to work with me. 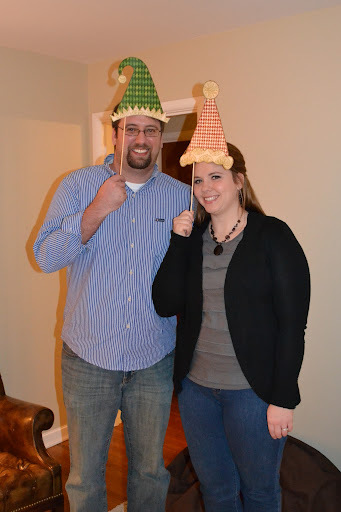 I had such high hopes for these funny Christmas photo props, but we were all worn out and hungry. I snapped a few pictures really quickly, then we had to move on. 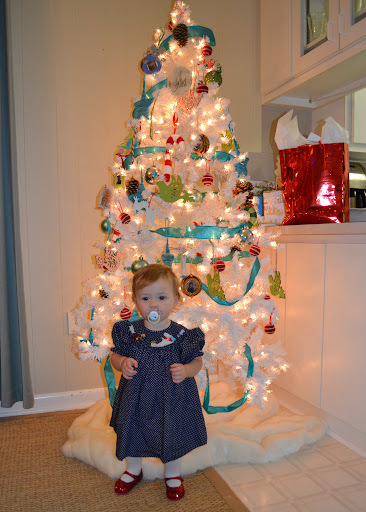 While I was doing the scavenger hunt with Spencer, Evelyn was playing in the toilet in her Christmas dress. A little scavenger hunt of her own, I guess. After washing her hands thoroughly, we all sat up to eat our family's Christmas Eve tradition of Sausage Breakfast Casserole (not the gross, soggy ones with nasty doughy crust--this is amazing), Pepper Jack Cheese Grits, and Hot Curried Fruit. I'd told the fam that we'd love to have everyone after the Christmas Eve service, but that I only thought I could pull off Little Caesar's and fresh fruit. Luckily, mom and Hillary (in from Nashville) volunteered to cook "Christmas Eve Dinner" at Mom's and bring it over after the Christmas Eve Service. So, we all ate a delicious home cooked meal in the comfort of our own home where no cooking or clean up had to take place. Merry Christmas to me. I do think I set the table, sorta...and, I had Sandi Patty's Christmas Album playing in the background, because that's the Christmas music of my childhood. 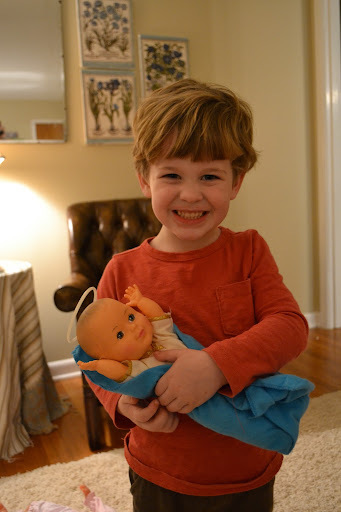 Spencer loved his baby Jesus doll, and Evelyn cried and threw fits all night that it wasn't hers. Veggie Tales Christmas movies were watched by all, and then everyone went to sleep, until the usual middle of the night wake up calls. In order for all of the Vinsant Family to be together this Christmas, we celebrated earlier than usual, on the night of the 21st. It was nice for it to be un-rushed and not lost in the midst of hurrying from one place to the next, however Spencer had a hard time obeying the entire night, so it was not very peaceful or fun for me or his dad, until his dad took both the kids home leaving me to sit with the fam' for a while that evening. It was then I realized I had a lot of work ahead of me for 2013. I'm glad to report that things are already going better on the behavior front. Anyway, back to Christmas with the Vinsant Clan. Gigi had the table decorated so beautifully, and I told her so. She laughed and told me that you have a lot of time to decorate the table if you decide not to decorate the tree. I hadn't noticed until she said that, but I had to take a picture of the tree--the year it had no ornaments! I so enjoy and appreciate her freedom to do what comes and let the rest go. More goals for 2013. 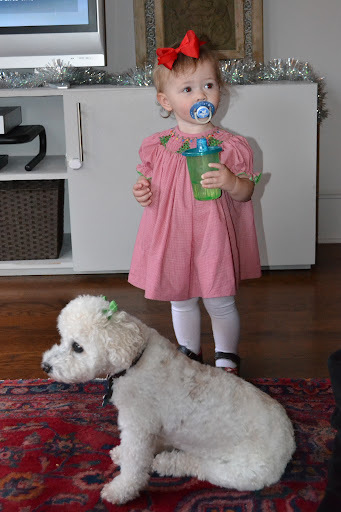 Spencer noticed and pointed out that Evelyn and Angel both had bows--one red and one green. It was hilarious. Both of these girls looked beautiful. 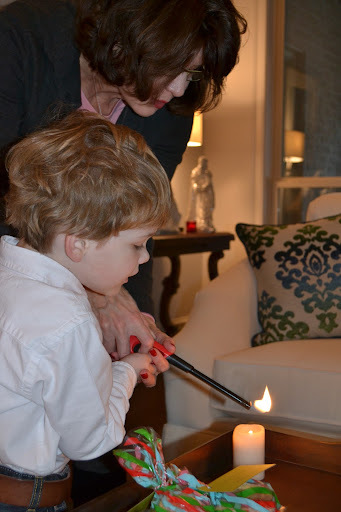 Spencer got to help Gigi light some candles. This was part of the beginning five minutes where he had his shirt tucked in and a belt on. That quickly became the least comfortable thing in the whole world and had to be abandoned. He did great lighting the candles, though. I remember my aunt Alicia helping me light candles at Christmas time. When Spencer saw uncle Tony home for Christmas, he ran over and gave him a huge hug. It was a bit of a surprise for all of us, I grabbed the camera and got a quick (blurry) shot of the manly sweetness. Spencer loves his aunts, and they love him. He happily smiled with them for a picture. 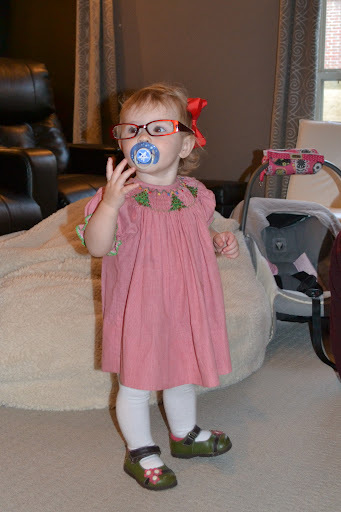 Evelyn Rose enjoyed wearing Gigi's glasses. She was cracking me up. She actually looked really cute in them. And, it wouldn't be a trip to Gigi's without a little bit of Sprout. We got through Spencer screaming in defiance throughout dinner time and moved on to presents. Things got wild quickly, so the pictures reflect that. 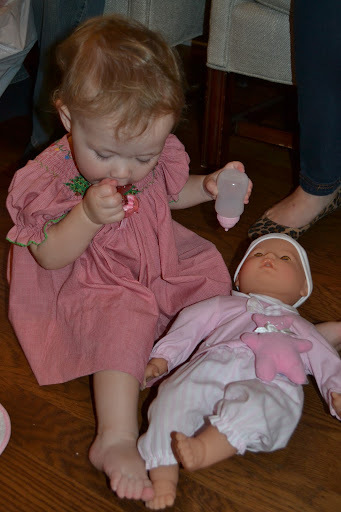 Evelyn got a baby doll that she immediately loved. 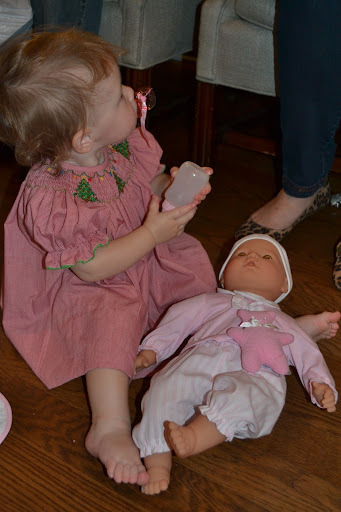 She wasn't sure she wanted the baby doll to have the pacifier, though. Spencer got a bicycle, and he has been enjoying that. He took a long ride with a little help all around Gigi's neighborhood last week (the last week in January). Everyone was spoiled, including the lucky gentlemen who received Theological Trading Cards from the Kelleys. I know you're jealous. 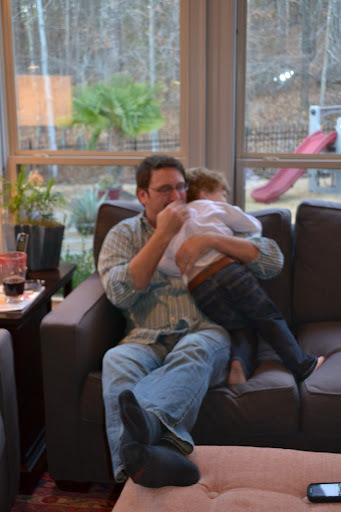 Once my kids' screaming and crying had reached a fever pitch, Jonathan took them home, gifting me with uninterrupted Christmas dessert time with my family. Little did we know that this evening would pale in comparison to the Christmas "excitement" to come.